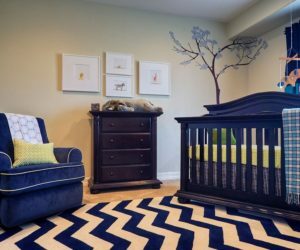 Creating a home that features distinctive decor hinges on pulling together a room that reflects your personality and style. Modern wall art can add color, texture and dimension to any space while conveying your preferences, making a political statement or simply presenting a piece that draws you in. Artworks can be colorful, neutral, metallic or a combination of those things. 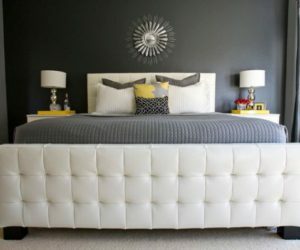 The most important considerations when choosing a piece of modern wall art is first, that you connect with it on some level, and second, that you have a space where the piece will work. Geometric pieces that feature perspective are good choices for modern wall art. Thought-provoking works are common in modern wall art. These vintage elements come together into a colorful and modern piece. A closer look at the materials in her work. 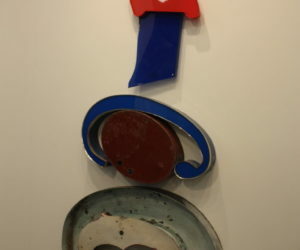 Typical of abstract pieces, the meaning is in the eye of the beholder. Diptychs are a great art form for a large wall. 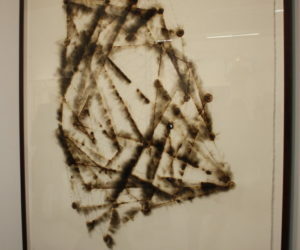 This work is composed of burnt adhesive and graphite on Arches paper. La fuite nocturne n°6 is composed of acrylic paint on canvas on wood, with white neon tubes. If adding color is the goal, there are lots of choices when considering modern wall art pieces — your only limitation will be your budget! A bright piece like this graphic work is thought-provoking and a bit retro. The textured canvas adds an extra sense of depth to the piece and helps the piece stand out. It is a bold piece that will make a statement on any wall. Colorful and complex, this work by Jannis Varelas from the Breeder Gallery is versatile thanks to the variety of colors used. 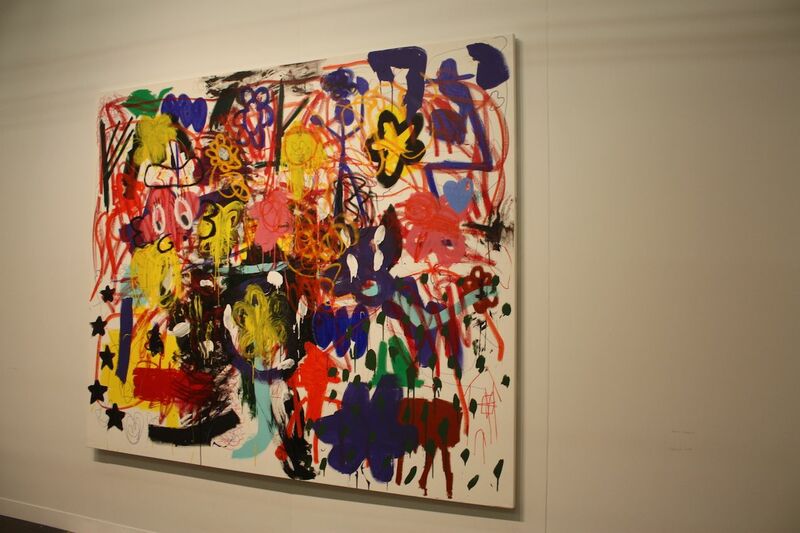 The artist’s works “map a maximalist system that records and shapes the notion of absent-mindedness.” Its vivid hues and bold strokes are perfect as the centerpiece of a white wall, accompanied by minimalist furnishings that allow the art to shine. Modern wall art is almost always a conversation starter. 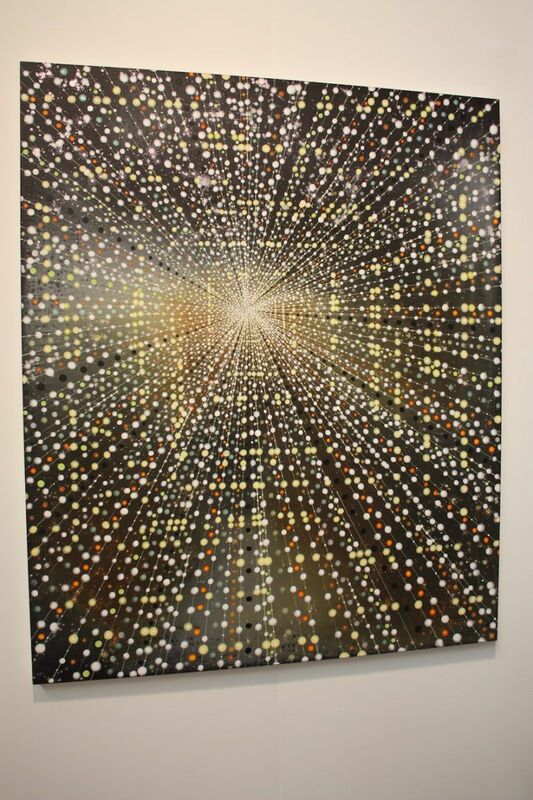 Geometric repetition in a variety of scales is at the center of this bright piece named Happiness by Satoshi Ohno. The combination of neon colors and a silver background make the work pop. It’s an excellent example of modern wall art that has a casual but contemplative feel and is suitable for brightening up any living space. Ohno’s recurring prism design is inspired by moths flying into a streetlight. A wide piece of modern wall art like this one from Blank Space is good for a large wall. 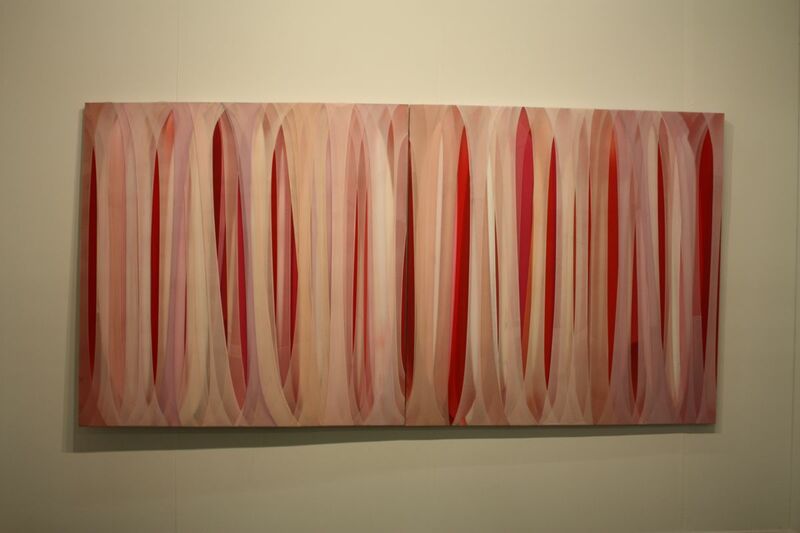 The vertical lines give the illusion of a veil hiding something in the background, accented by the dominant red color. 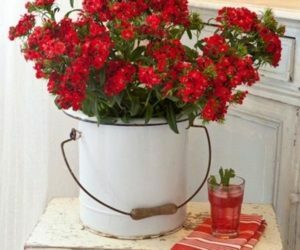 It’s a fine way to add a big dose of one color to your space without introducing a lot of other accent colors. 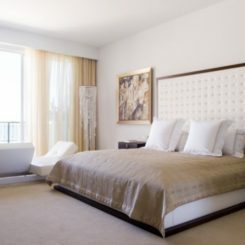 Modern wall art can convey a sense of calm in room, as this piece does. 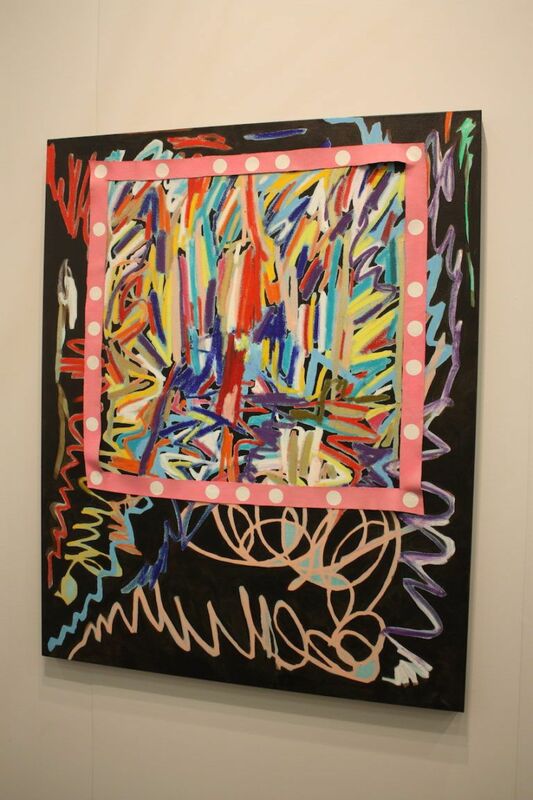 Sarah Cain’s work called Sight and Light is a piece that features a range of colors, made more dominant by the dark background. The artist says she refuses to stick to conventions about modern art, and you can do the same by including innovative pieces of wall art in your home. A work like this conveys boldness and strength, making a strong statement in a room. Bold works like this will dominate a room. 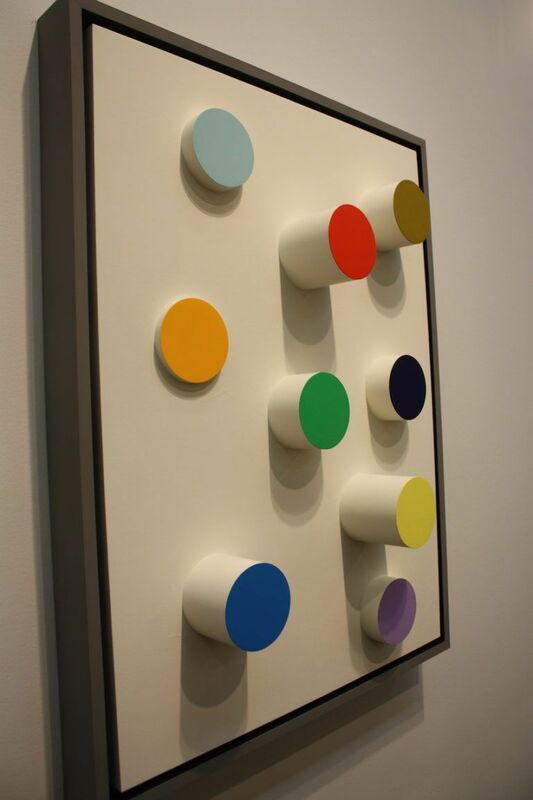 Modern wall art is a way to let your love of color shine. Smaller works like this one by the late David Hare feature vivid hues, texture and detail in a way that will add a great deal of interest to a room. 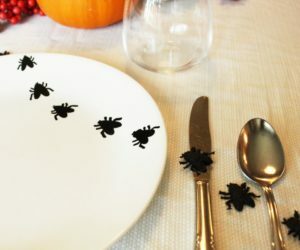 Creative pieces like this one are versatile and still command attention even though they are smaller. Hare worked in a variety of media but was best known for his sculptures. If you’re into tech, you can have modern wall art that adds a dose of the digital. 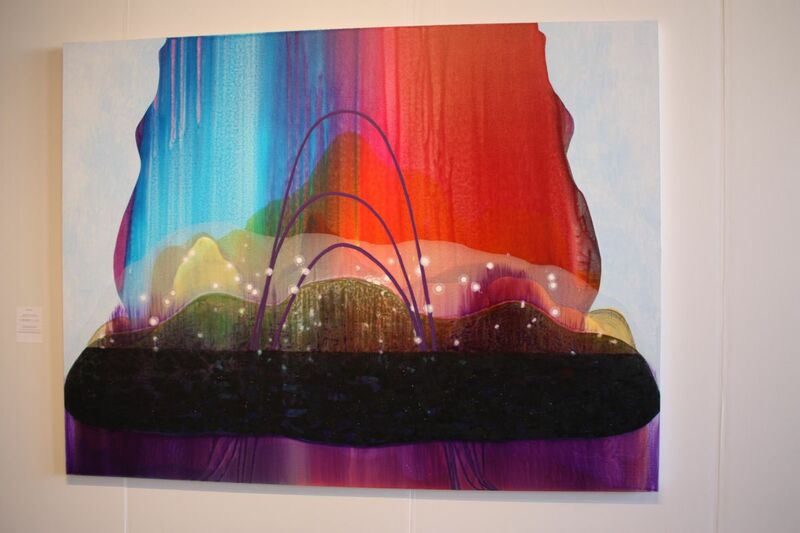 Carrie Moyer’s Intergalactic Emoji Factory is created with acrylics and glitter, forming a piece that is part fantastical landscape, part abstract work and part modern commentary. Pieces that are more futuristic work best in contemporary and modern spaces. Moyer is a writer as well as an artist. Of course, modern wall art does not have to colorful. Despite the subdued tones in this work by Alexandre Farto, known as Vhils, it is evocative and conveys a dramatic feel. As Vhils website says, this type of piece is “visual poetry” and is an absorbing choice for a living room wall. The perspective from a distance, and the detail of the work involved from a closer angle, add to the interest and complexity of the piece. Vhils was a Portuguese street artist before turning to other media. The intricate paper work is very interesting. A subdued color palette can still equal lots of drama in a piece that features perspective, as this one from Barbara Takenaga does. 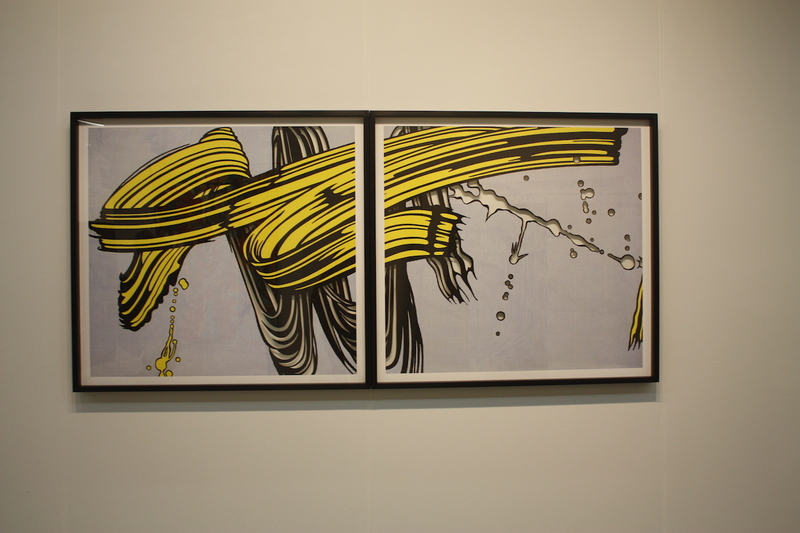 A piece of modern wall art can add depth to your space when the work itself has the intensity that this one does. In addition to the overall feel, the meticulousness of the free-hand painted dots and lines add to the wonder that this piece will add to a room. Perfect for contemplating and daydreaming, modern wall art lends itself to exercising your imagination. Lots of modern wall art includes textures that are created in a variety of ways, which can lend extra depth and interest to your living space. This work relies on a unique texture, not bright color, to create interest. 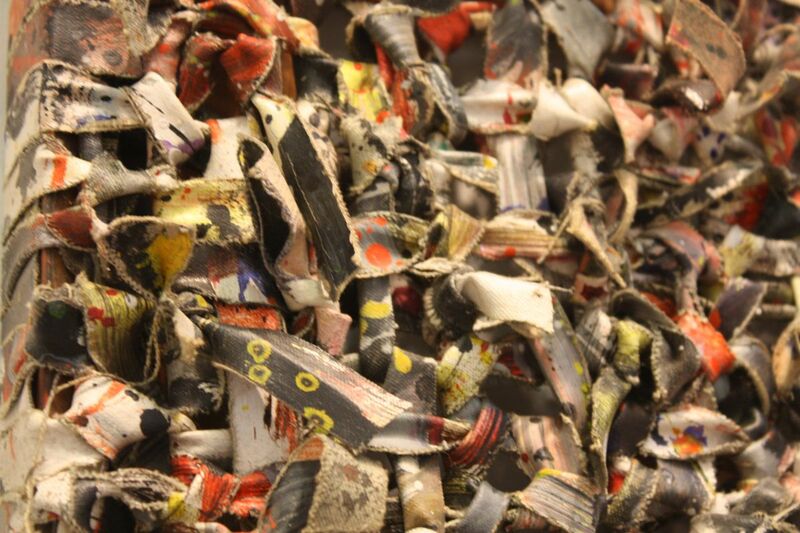 Thousands of canvas shreds that are tied into knots form the wave that pours down from the top of the site canvas. It’s an intriguing piece of art that invites endless interpretations. A close look at the painstakingly tied and arranged strips. 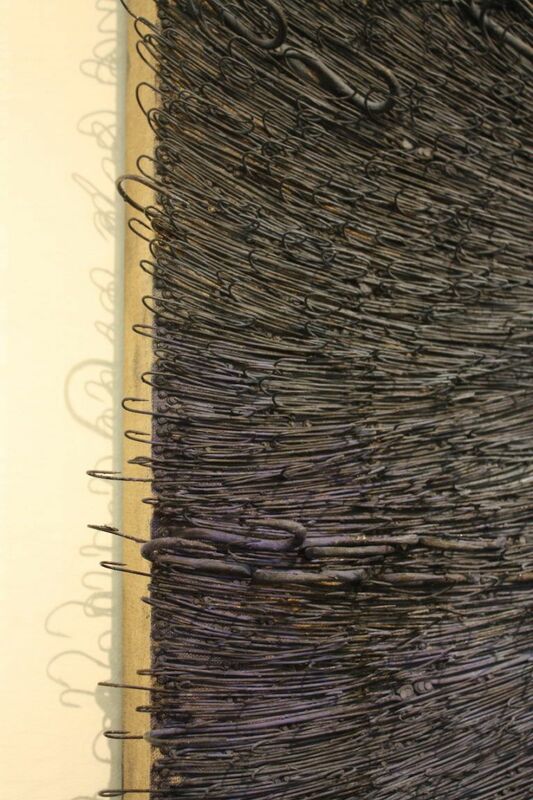 Cuban artist Diana Fonseca also relies on texture more than vivid hues to create her intriguing works. The mixed media that she uses form a cohesive, yet uneven textural piece that brings forth feelings of the past, almost a historical feel. The soft colors used make the piece suitable for a more rustic environment as well as a modern one. 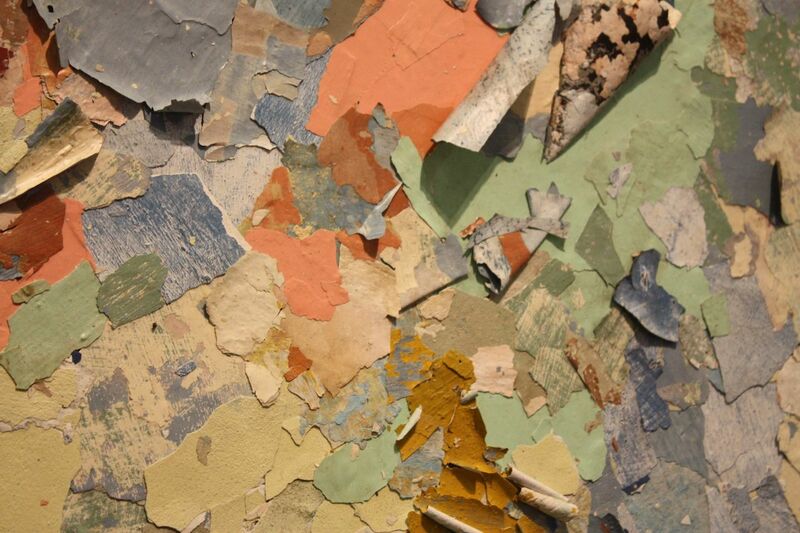 The rolls and chips of paint make you think of old buildings, peeling paint, and architectural history. 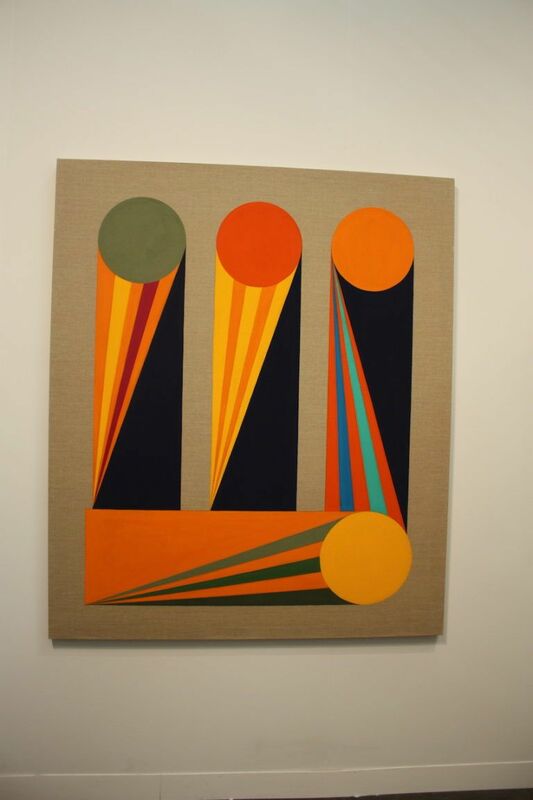 A vivid, earthy orange-red is the dominant color in this geometric work by Enoc Perez. The precise squares combined with the more abstract color application create a piece of modern wall art that will ground the space in a room while simultaneously adding a sense of movement. 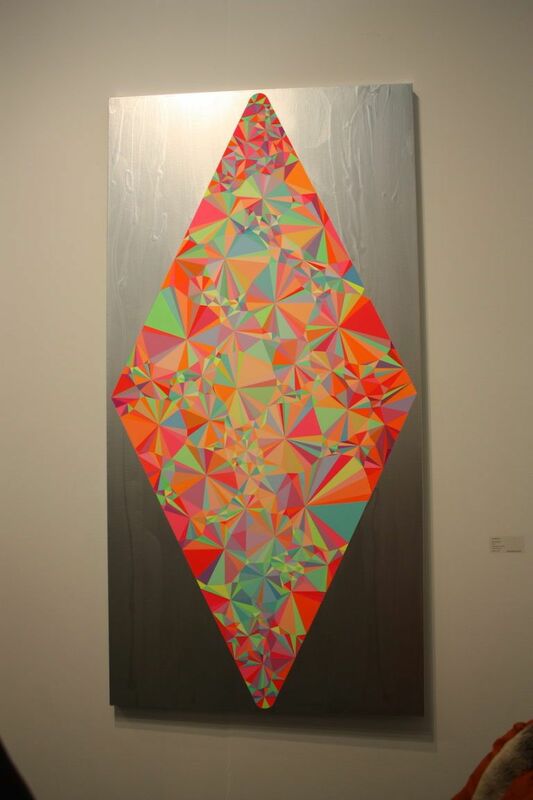 Artsy says that Perez mimics the process of color printing by making drawings for each color and using sheets to transfer the paint to the canvas. The piece has a geometric feel, but conveys a softer-than-usual sensibility. Sometimes modern wall art features a non-traditional material as the canvas. Here, Gareth Nyandoro has mounted his ink on paper Straw hat and Bhero Vendor on canvas, but not in a traditional sense. 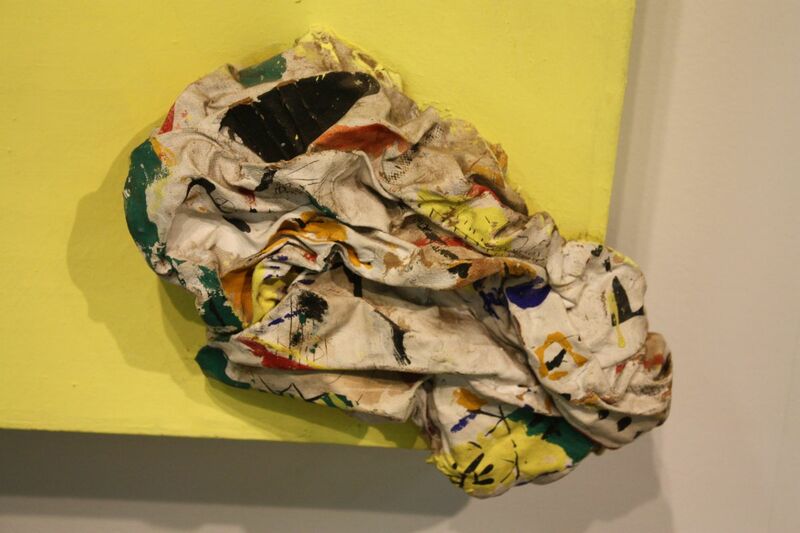 That’s perhaps one of the greatest this about modern art: Its unexpected uses of materials. The unstretched canvas gives the piece a casual, almost fresh-from-the brush feeling. Displaying a such a work in your space makes it look like the artist just came in and tacked it up. Non-traditional mounting gives art, and by extension the room, a looser feeling. 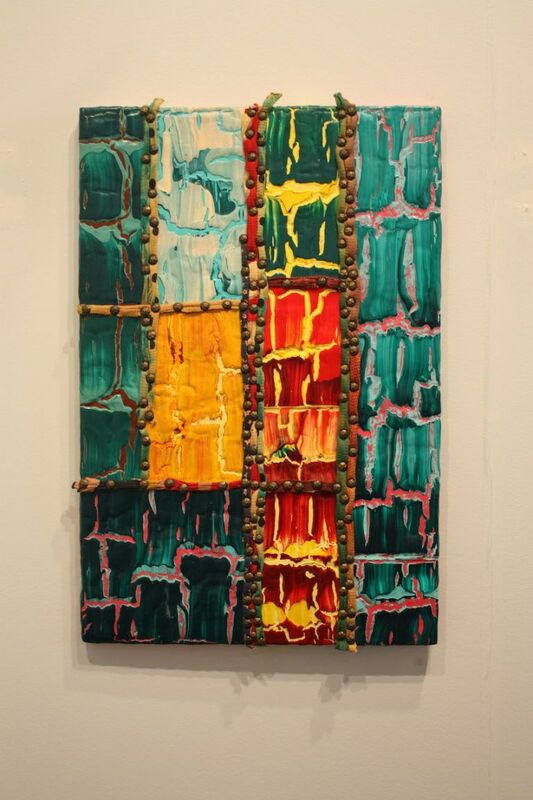 Color can also be enhanced by added texture, as is the case with this work by Thomas Trosh. There is a lot going on in this piece of modern wall art and it would be appropriate for a more restrained space where it could stand out. The artwork offered many elements for examination and contemplation and should be displayed where those features can be appreciated. The vibrant work is very stimulating and engaging. A traditional painting can also offer texture. 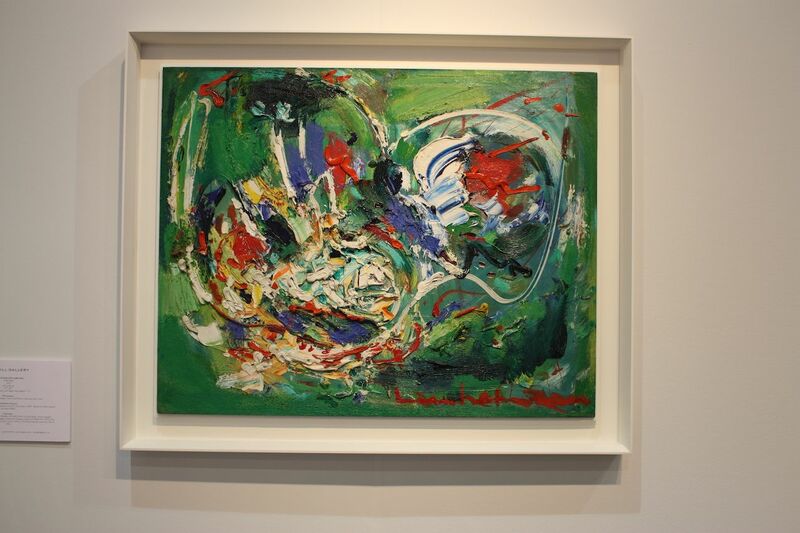 This dominantly green work presented by the Hill Gallery employs the textural application of paint to create depth in combination with vivid colors. 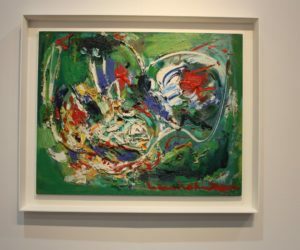 The abstract work is captivating and a perfect medium-sized piece for a living room, dining room, or other gathering space. 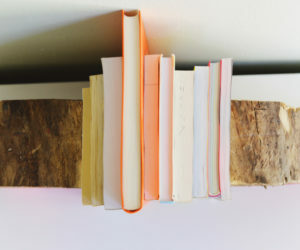 It lends a pop of color, texture and inspiration for thought. With subtle texture and neutral coloring that is haunting, Jay Heikes Zs is adds a sense of tranquility to a space. 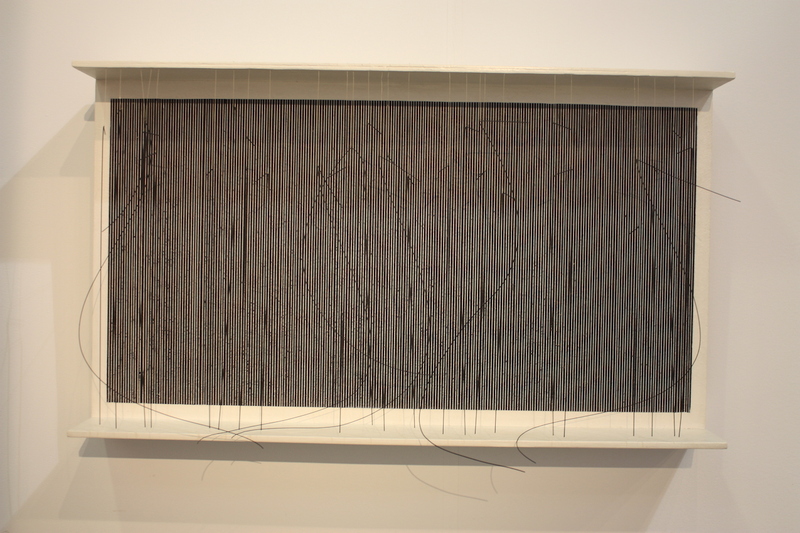 The burlap background and the raised letters contribute to the meditative feeling of the work. Heikes is known for his works that use pop culture text or images and transform them into a tale about struggling for individuality. 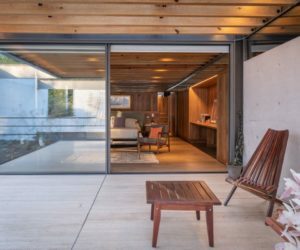 Zs also includes pigmented mortar, steel, iron, aluminum and wood. Equally neutral, but far less subtle is this triptych by Pier Paolo Calzolari, who is known for “bringing quotidian ritual into the realm of aesthetic experience,” according to Artsy. 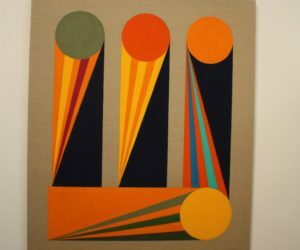 A piece of modern wall art like this is very avant garde but will work well with other types of art and in a variety of styles of decor. 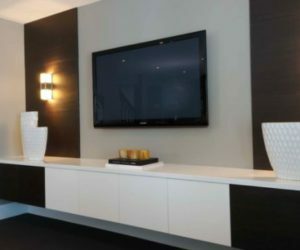 Displaying a work like this also adds a touch of sculptural dimension to a space without being overwhelming. 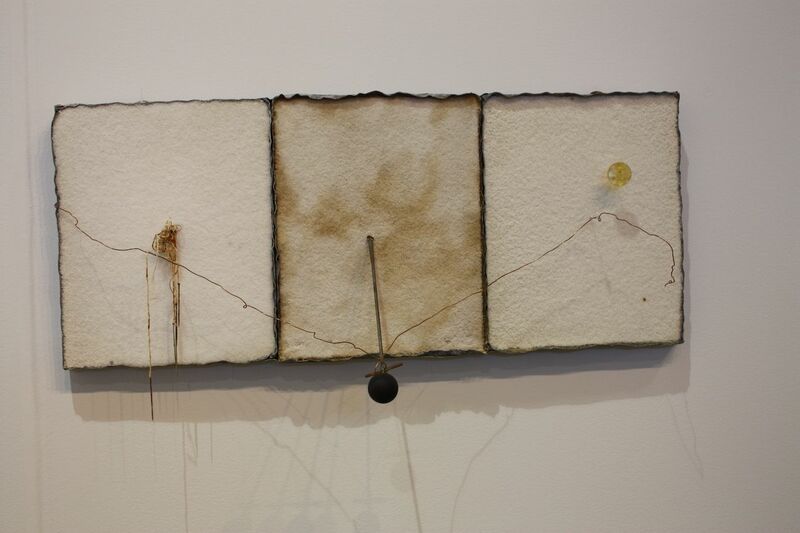 The untitled work is made with salt, lead, iron, copper, mother-of-pearl, burned wood and cotton thread. 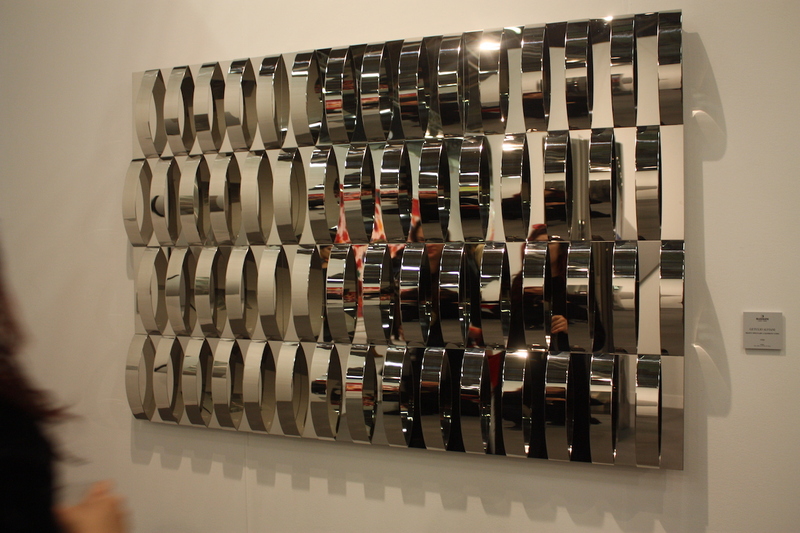 Polished and reflective, this modern wall art piece is all about the shine and dimension that only metal can provide. Italian-born Getulio Alviani created Rilievi Speculari a Elementi Curvi, from steel, focusing on the curves and resulting reflected images the piece exposes. 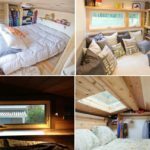 The work adds a bit of flashiness to any space, but not so much that it overwhelms. It is somehow reserved and dramatic at the same time, offering an ever-changing artwork that shifts its colors and dimensions based on who is standing in front of it or what other colors are in the room. Alviani’s work is made of highly polished steel. 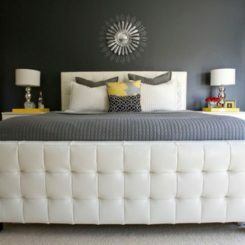 If you really want to add dimension and depth, opt for a piece of modern wall art this is more sculpture than painting. 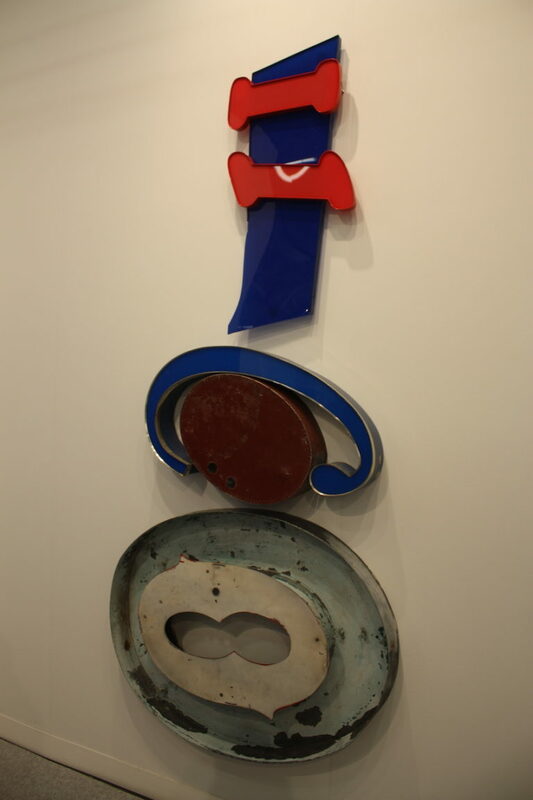 Jack Pierson’s Blue Guitar uses pieces of lettering from old American highway signage to form the piece. 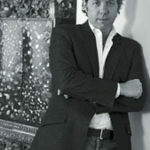 While Pierson has worked in many media, he is best known for his works using signage and large-scale vintage lettering. This piece is imaginative, colorful and an ingenious reappropriation of iconic elements that will be a conversation piece for any wall of your home. 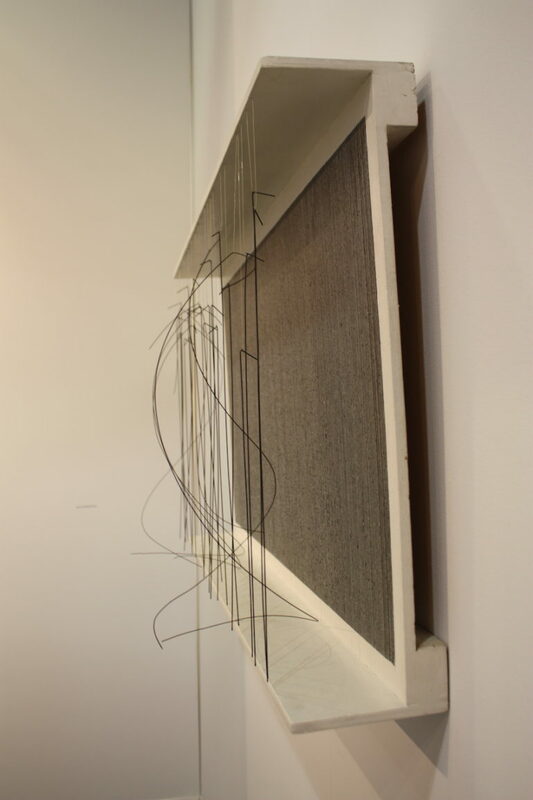 Sculptural modern wall art can also be more defined in space, as are the pieces of Jesus Rafael Soto. 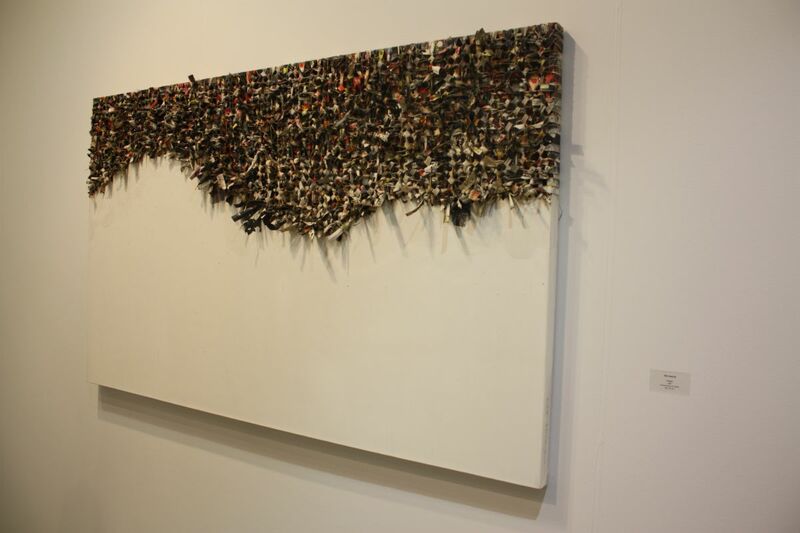 The artist creates sculptural reliefs like this one named Excritura, made from industrial and synthetic materials like nylon and steel. 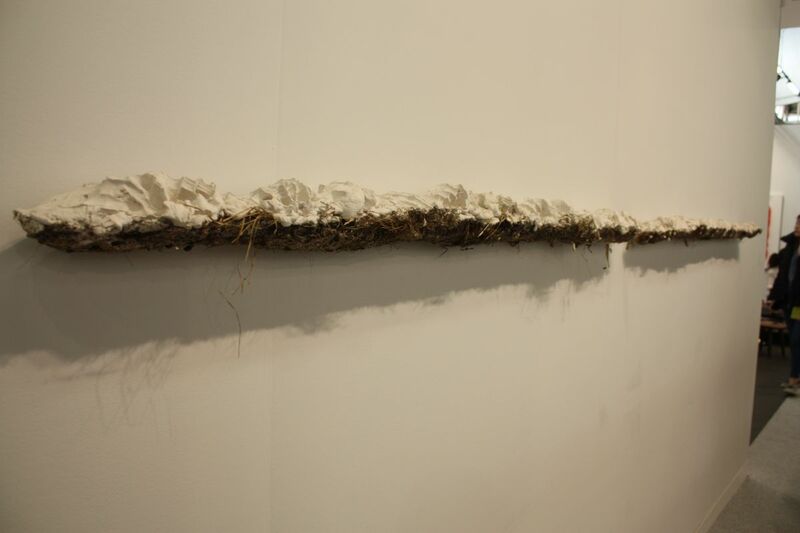 Devoid of color, the works add dimension to a space, summoning viewers to come take a closer look at the fine lines and errant wires that form the essence of the piece. It’s a piece of artwork that needs a wall where family and visitors can examine it from different perspectives. The dimension of this pies is delicate and requires examination. A side view of how the illusory piece creates dimension. 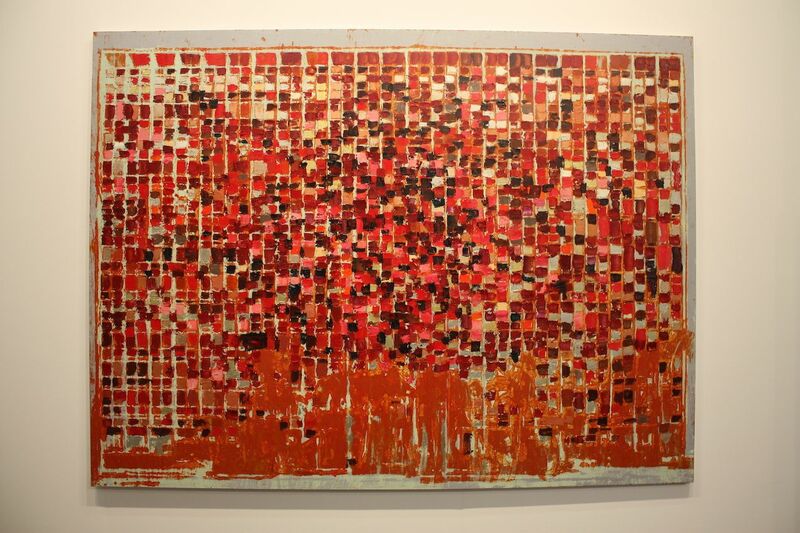 Creating depth and dimension using a technique that involves burning the canvas to the point of scorching is a process used by artists like Jitish Kallat. Inspired by his native city of Mumbai, Kallat makes modern wall art pieces that speak volumes with their scorched and burned lines, spots and shadows. The artwork adds interest to a room without adding color. German artist Otto Piene is also known for his Rauchbilder — smoke pictures — that he created with solvent and fire, forming images from the resulting soot. It’s a technique similar to Kallat’s above, but yields very different results. This untitled work is more textural and features worthy colors that would work very nicely to highlight a space that has a mainly neutral color palette. The layering of elements is another way artworks create dimension. This Untitled (Yellow and Green Brushstrokes) by Jose Davila features a bold stroke of color that spans the diptych and employs a layered print technique to enhance the pop and depth. It’s a modern wall art piece that would work with a variety of decor styles — as long as you want a pop of color. 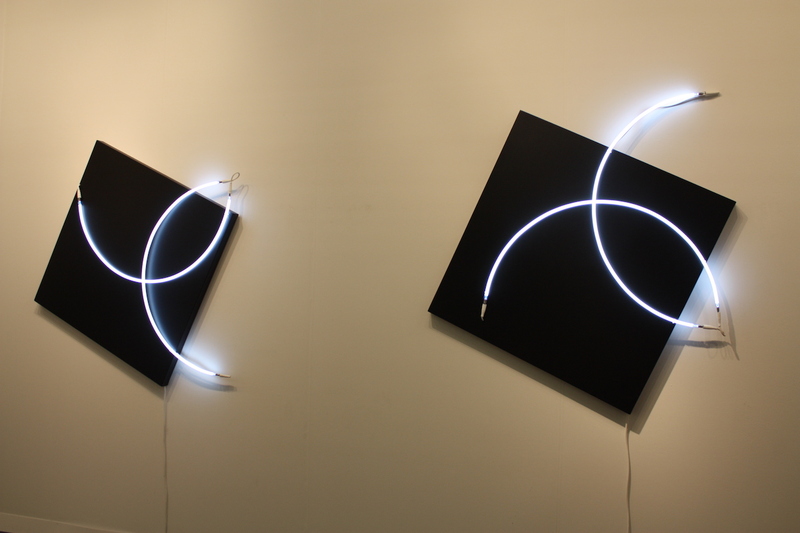 Traditionally reserved for commercial signage, neon is often used in art to represent light as well as express viewpoints. This work is modern wall art that is abstract and engaging. 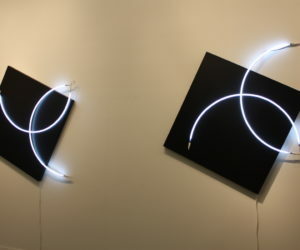 Created by the late Francois Morellet, the work features simple arcs of neon that when combined with the black canvas, evoke a sense of movement and transformation. 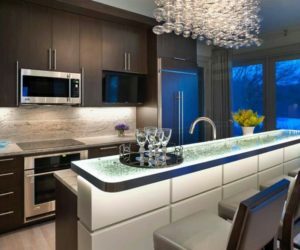 Pieces like these are perfect for an area where you want to add some modern drama and where the environment is right for the neon light to create a statement. 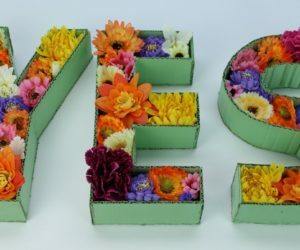 If you like to make a philosophical or political statement with your art, a piece of modern wall art in neon that features a provocative phrase is a good choice. 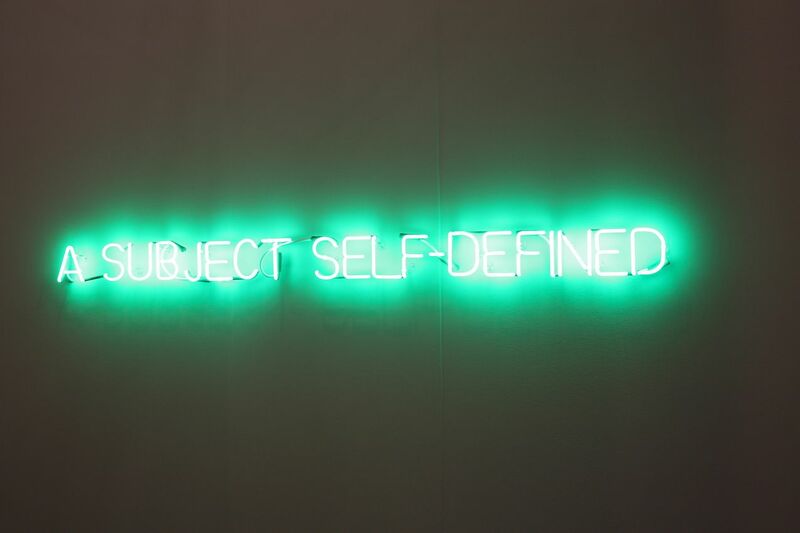 Joseph Kosuth‘s conceptual art includes a series that features language and forms the body of work that he is best known for. This will definitely elicit conversation from guests, many of whom will want to debate the subject. Regardless, these types of modern wall art works need to be displayed in a low-light space. 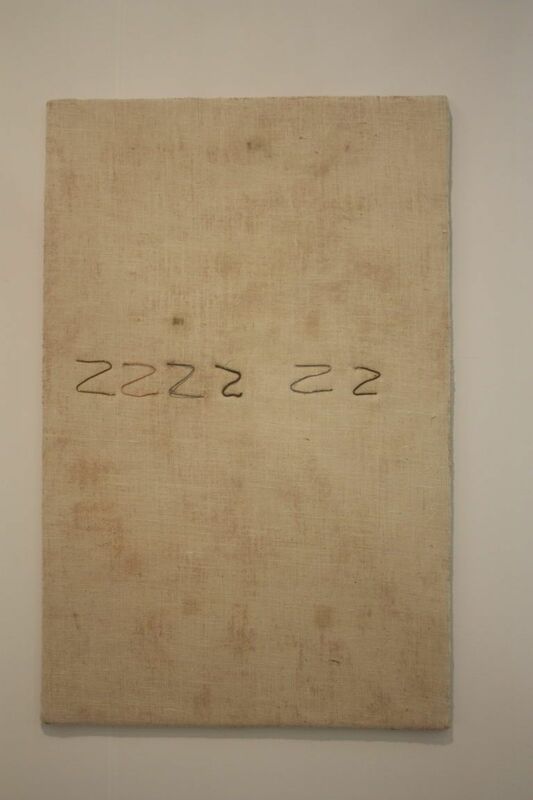 Kosuth is a pioneer in conceptual art. 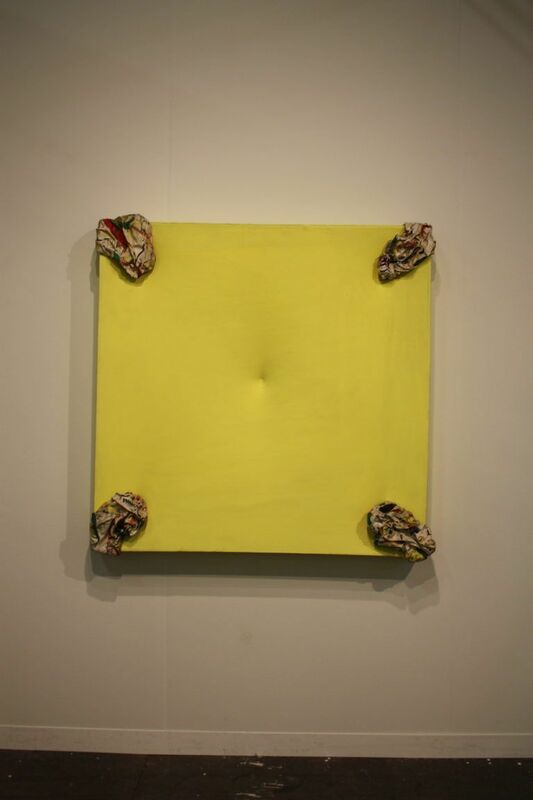 Modern wall art pieces often feature mundane items that are transformed into an art medium, such as in this work by Sao Paolo-based artist Marcius Galan. 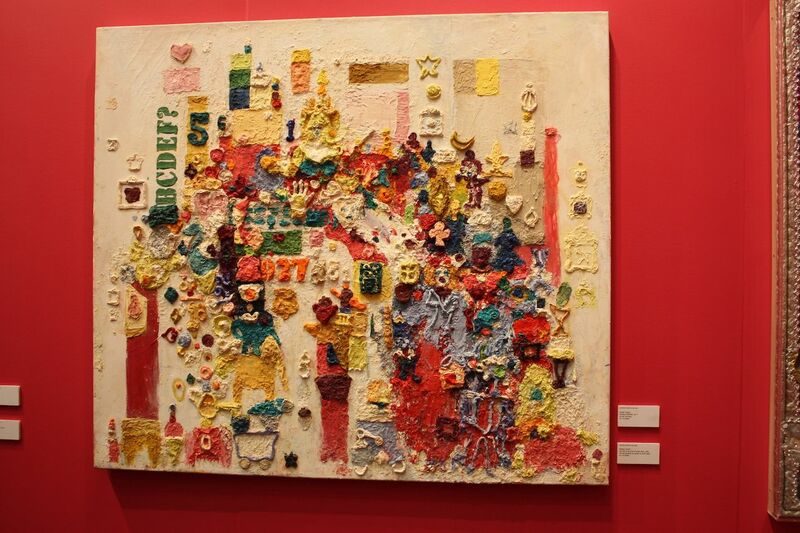 Here, Galan has used more that 65,000 cartographic pins to create a textural work that dominates the space with its bright red color. 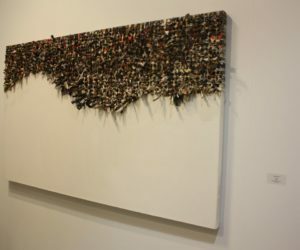 The artist says that his works explore the “metaphorical capacities of space.” Accordingly, a piece like this needs to be displayed on a large wall as it will dominate any living space. 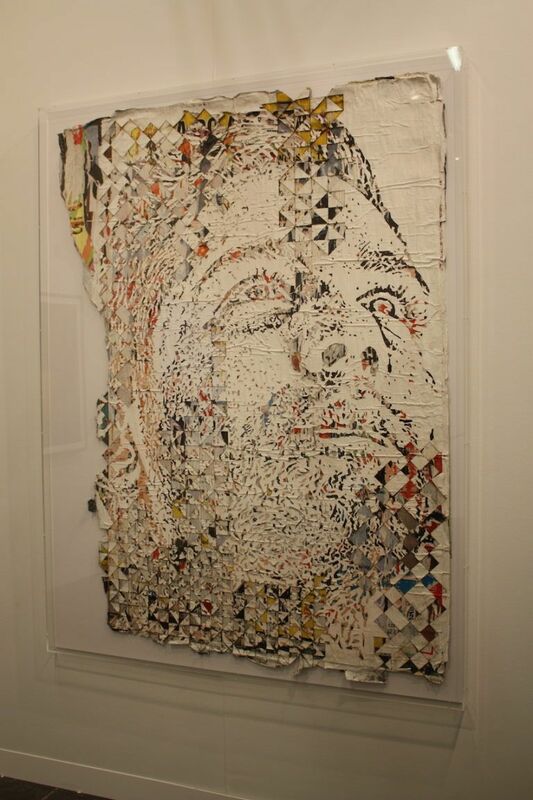 The painstaking work involved in placing the pins helps make the artwork a marvel of creativity and dedication. 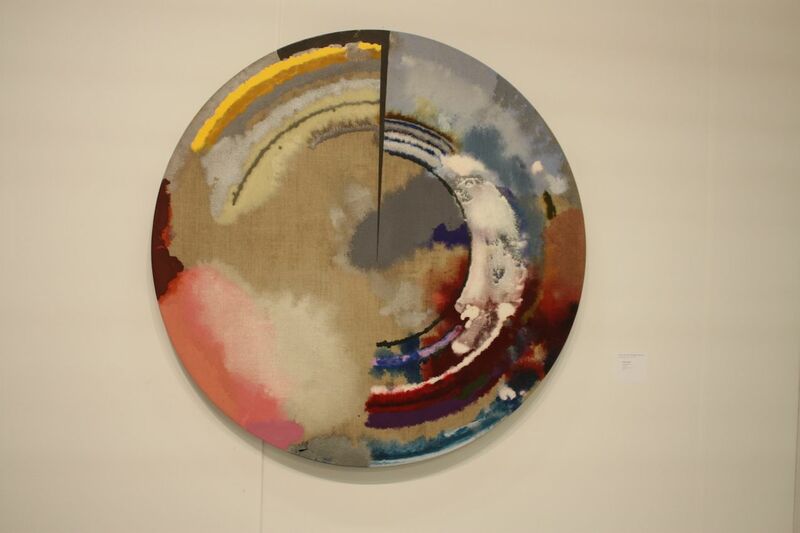 Pamela Jordan’s circular works are often colorful and always abstract. 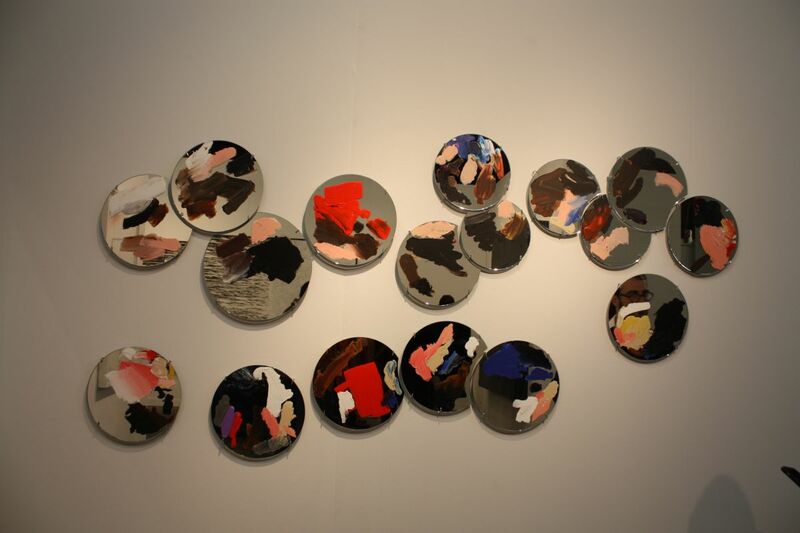 Round modern wall art can enliven a space with its different and unexpected geometric form. 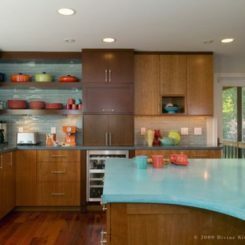 Here the colors are mainly earthy and make the piece versatile for almost any style of home decor. The design also seems to have the effect of movement because of the round swipe of color — almost like it was magically wiped on in circular fashion. Again, a work of this size and scale needs to be displayed in a space where it is allowed to dominate its surroundings. 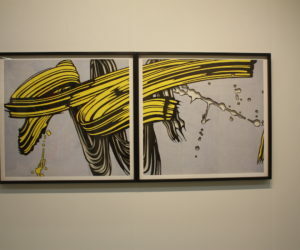 Most of the American artist’s works are oil on linen. Another way to add modern wall art that literally breaks boundaries is with a piece that combines a traditional framed shadowbox style piece with elements that extend beyond the confines of the frame. 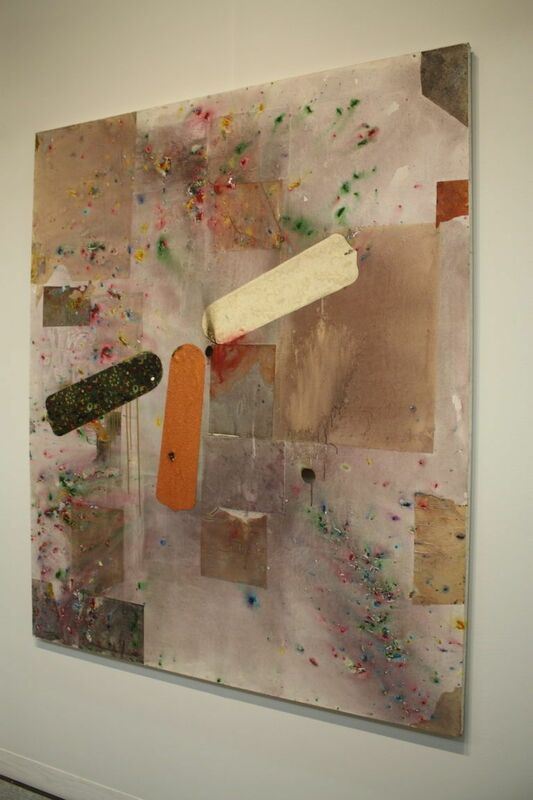 This Untitled (Spontaneous appropriation of space #1) by Rafael Domenech adds color, depth and interest to any space. Its modest size allows for versatility in display location. 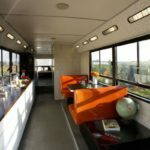 The work uses a variety of materials including repurposed graphic material, maple, polyurethane and plexiglass. Collaged and embellished in a three-dimensional format, this modern wall art is a painting that is transformed into a work that goes far beyond the traditional. Artist Shinique Smith uses found objects and second-hand clothing the she ties together to make sculptures and here, elements of the art piece. 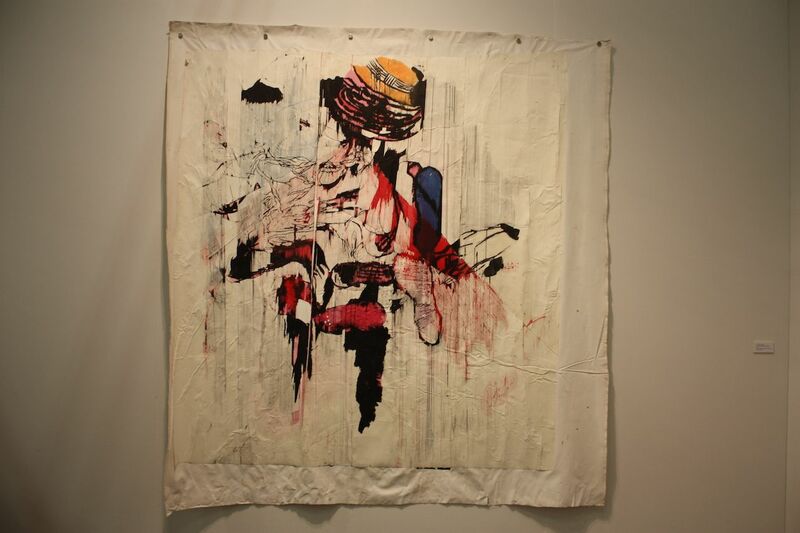 The is provocative and piques interest with its many elements. Incorporating this kind of art will add interest to a space. 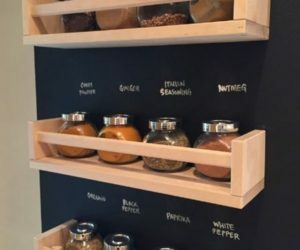 Displaying this type of work requires floor space, as well as wall space. Collaged modern wall art can add a pop of color and texture to your living space without extending from the wall, making it suitable for a tighter space or an area where you can’t have something dramatically three-dimensional. 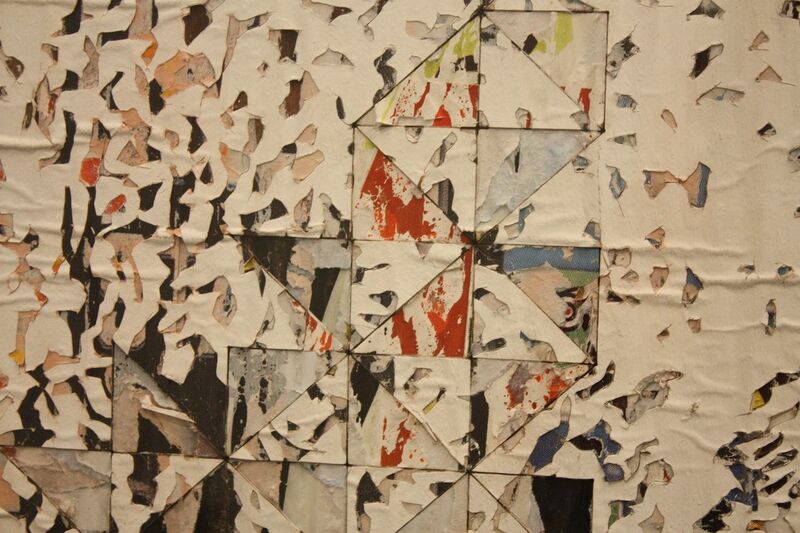 Collages by nature — no matter whether they use just paper or mixed media — convey the feeling of layers, depth and bulk. 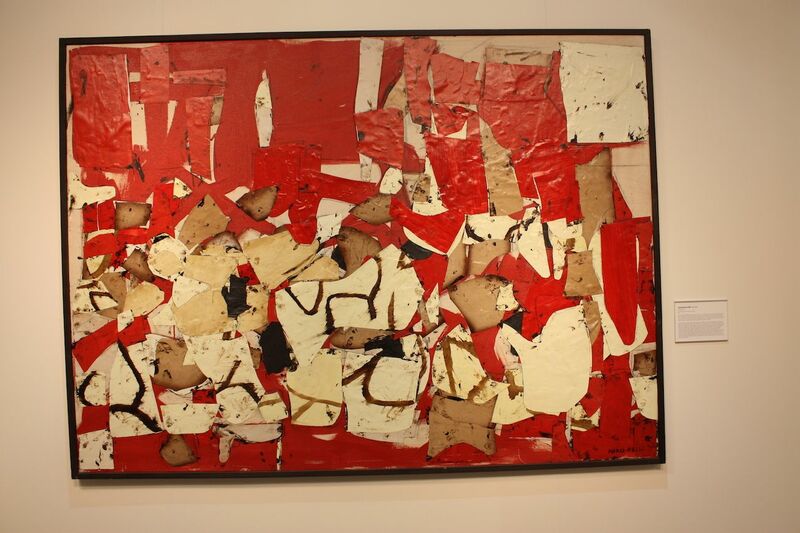 While this piece is rather large, smaller collage works can add interest to smaller spaces throughout the home. 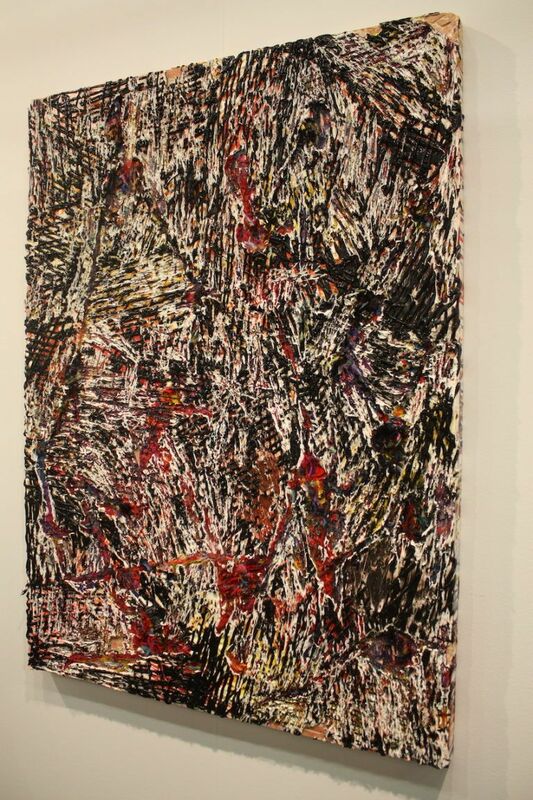 This work of mixed media including acrylic paint, paper, and wallpaper on canvas is by Brenna Youngblood. Called Blade Runner, it is another example of a mixed media work that has a very different vibe from the one above. The colors are more subdued, yet it is far from neutral. 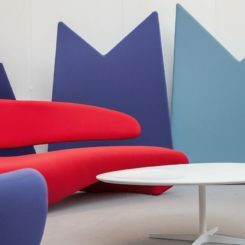 The combination coveys a lively feeling and it would enliven any living space with its stimulating composition. 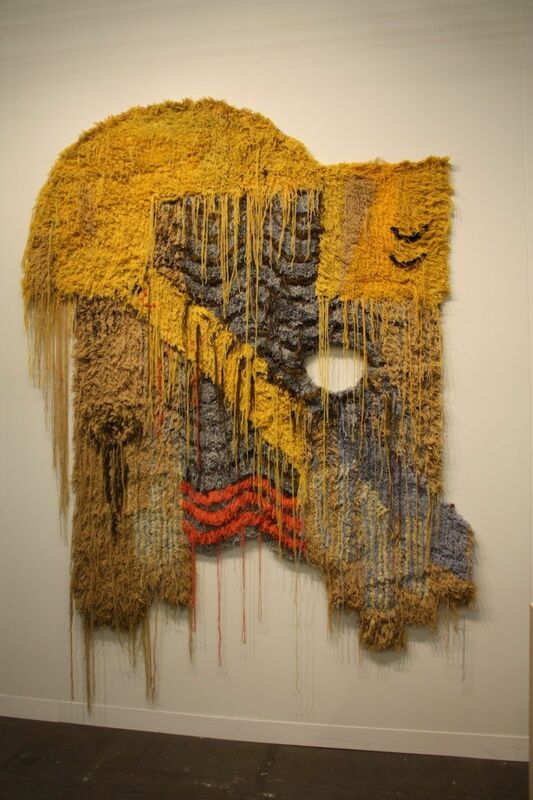 Youngblood’s work explores the urban African American experience, writes Artsy. Circles are a versatile graphic form and here artist Rodney Graham has used three-dimensional elements in his Cylindro – chromatic Abstraction Construction. The pieces colorful and minimalist, while also playing with light and shadow. This type of modern wall art needs the proper lighting to be appreciated and consequently should be displayed in a well-lit room. The piece is acrylic gouache on wood. 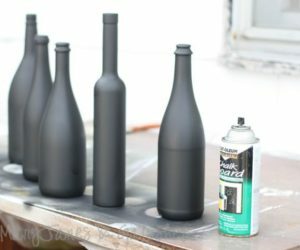 Choosing a work that includes repetition of an element, like circles, is a good choice for a large wall because it takes up a good amount of space without requiring a piece of unmanageable size. 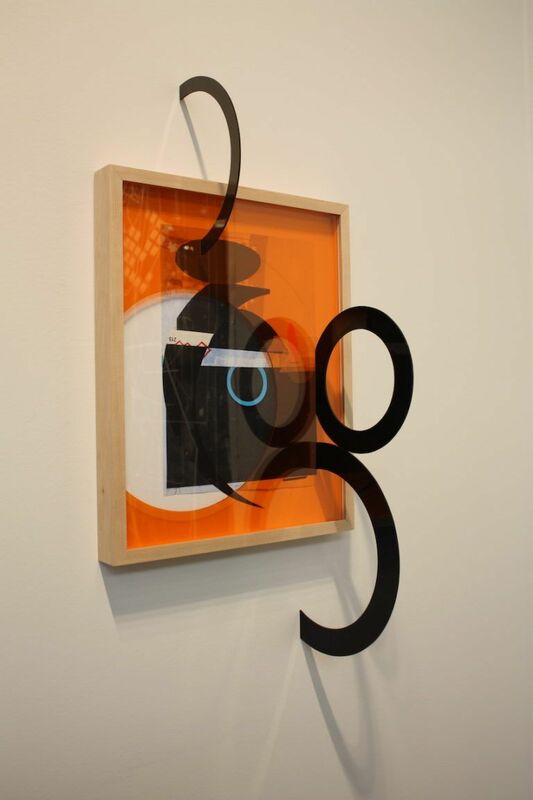 Ryan Gander’s piece is features variously sized round mirrors that contain different portrait abstractions and splashes of bright color. This piece would work best in a modern or contemporary space. Gander’s eclectic work generally defies categorization. 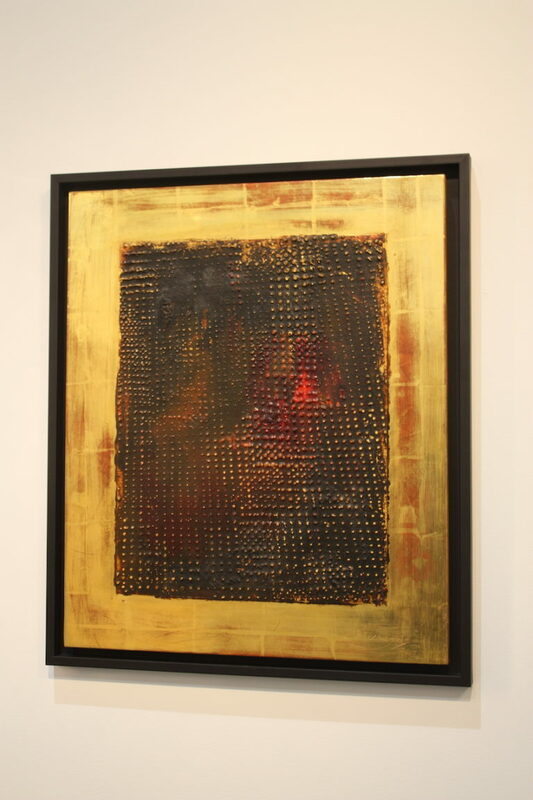 Definitely a piece for a very large feature wall, this round piece presented by the Sicardi Gallery features texture, geometry and pops of red. 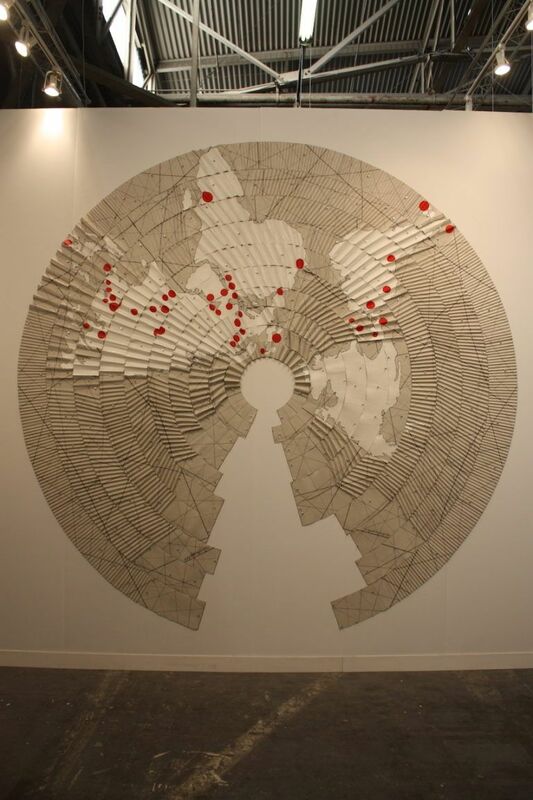 The various folds, lines and continental representations are a map-like piece of modern wall art that is also very textural. It’s sure to appeal to travelers and even armchair nomads who are drawn to all things global. This modern take on a map is a very engaging piece of art. 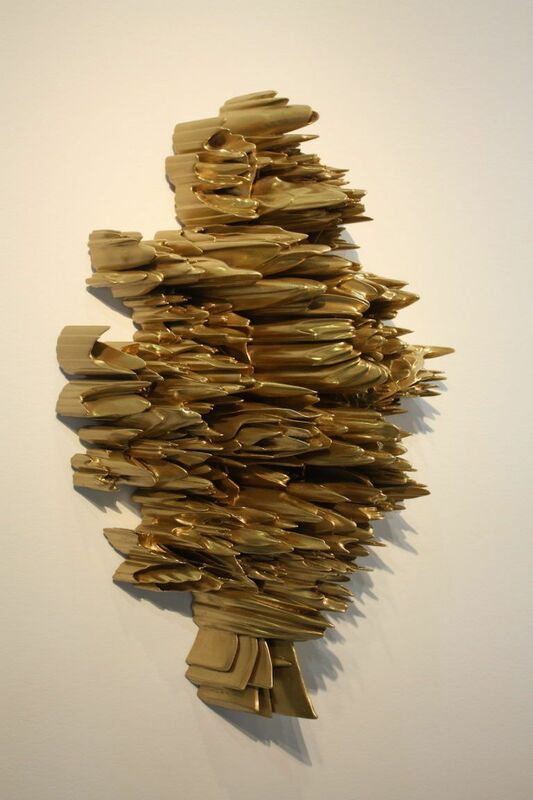 Sculptural modern wall art often makes use of upcycled materials in new and innovative ways. 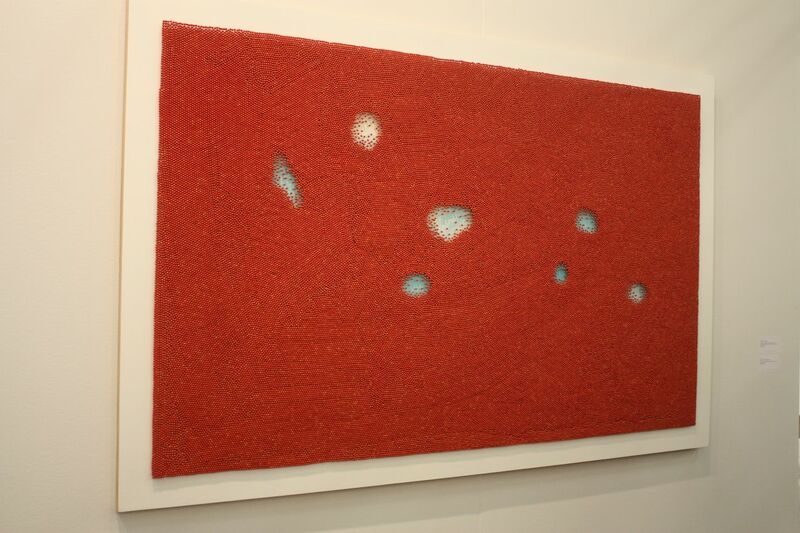 This work is by Sadaharu Horio, who is considered one of Japan’s most experimental artists of the 20th century, according to Artsy.His works use discarded household materials as in this minimalist work. 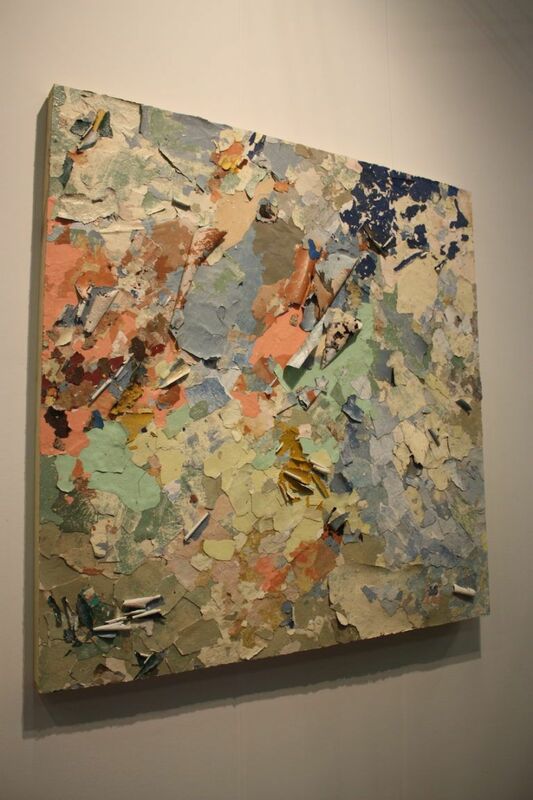 The bright canvas is accented with a textural element and features the four corner pieces from used material. The medium-sized work is colorful and will add brightness to a living space, while incorporating a bit of social commentary. The minimalist piece works with many decor styles. A close-up of the up cycled materials. 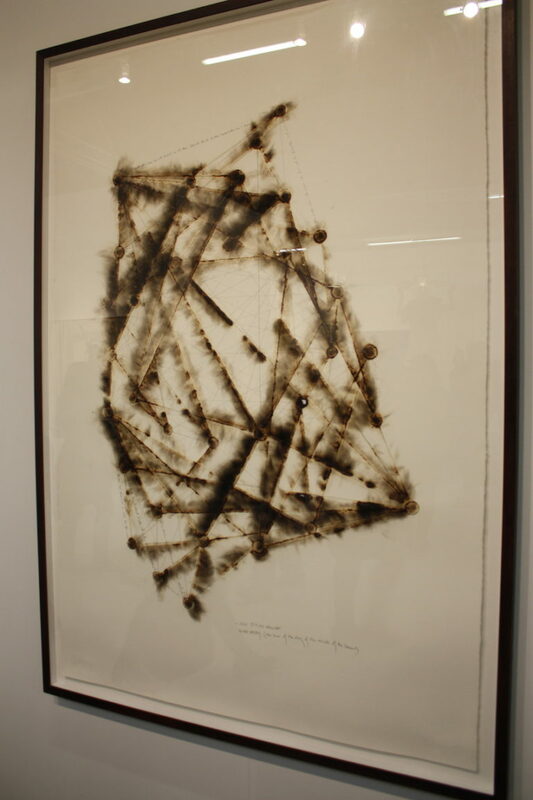 Some modern wall art relies on texture alone for drama, and a work like this by Leonardo Drew fits that bill. The artist uses found natural and manmade materials, especially wood, to make his creations. This one is also devoid of color, save for the light and shadow of the wood pieces. The dimensional construction immediately draws the eye and dominates the space. 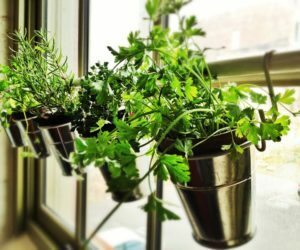 Works like this will work with many decor styles if displayed on a feature wall. This work by Drew is titled 139L. 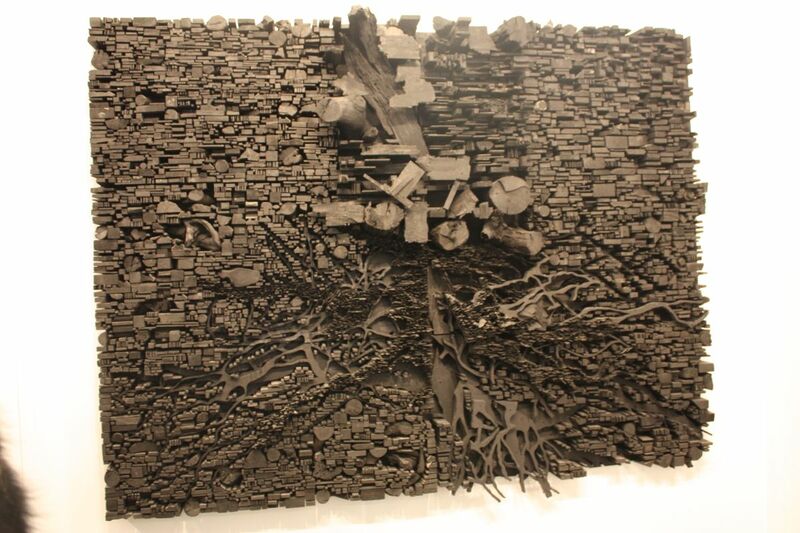 Textural pieces in metal are similarly dramatic, as is this piece with its deep, craggy surface. It is a small piece of modern art that can grace just about any wall, and could be combined with other types of artworks. The depth of the peaks and valleys gives it a bit of a dangerous air. 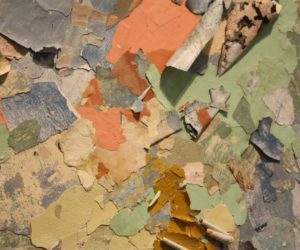 Just as textural but also a bit more colorful is this piece by Jacin Giordano, which gets its texture from the paint application method. The tangles of paint form spaces and voids, accented by the colors used. This is a great modern wall art piece for any room because it brings a tactile form to the smooth wall, creating a contrast that instantly adds to the character of the space. The work is acrylic on wood. Textile lovers can opt for modern wall art that features a variety of fiber constructions. 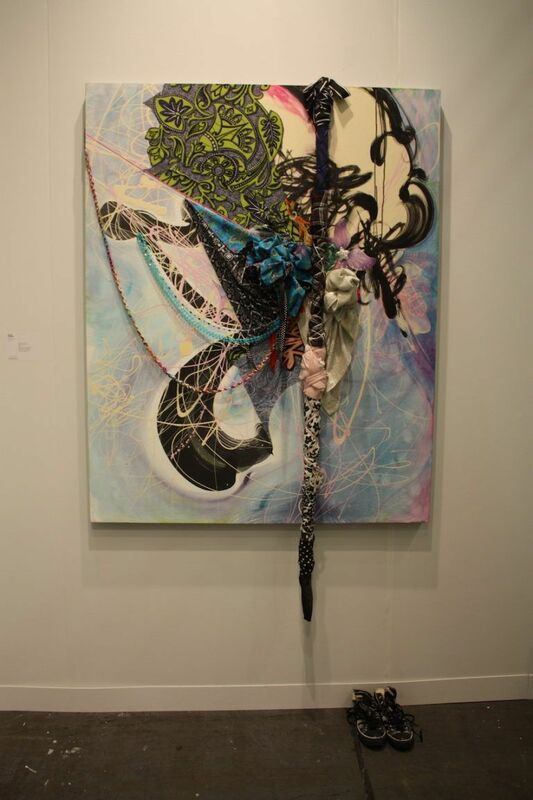 This is a very dimensional piece by Caroline Achaintre called Madcap. While it does ad color, the tactile nature is the dominant vibe. 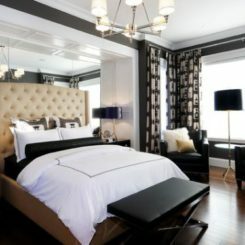 Incorporating a piece such as this in your home decor is akin to adding a conventional tapestry to traditional interior. 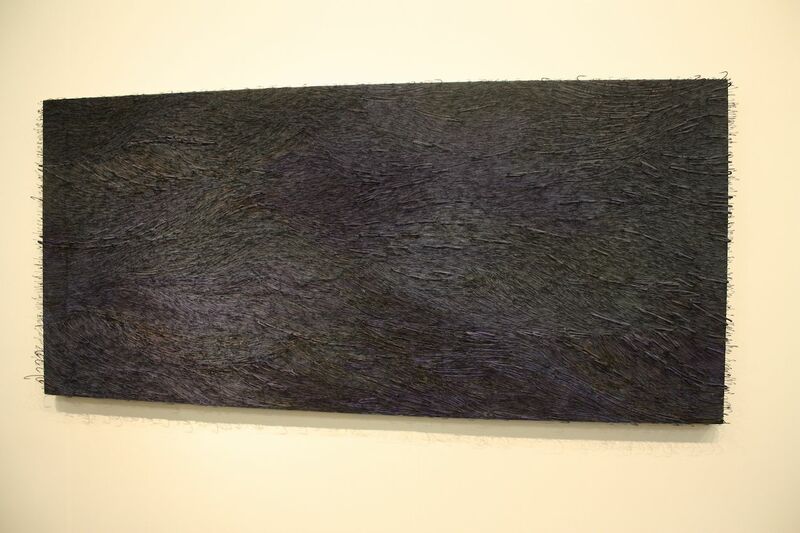 Hand-tufted wool is the medium used. 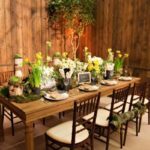 To injection a modern, rustic feel into a larger space, consider mixed media works that combine a minimalist profile with natural materials. This extra long sculpture would work on a feature wall or a gallery hallway where it could take center stage. The lack of colors and reliance on the materials to provide dimension make this an intriguing, if not unusual piece of art. 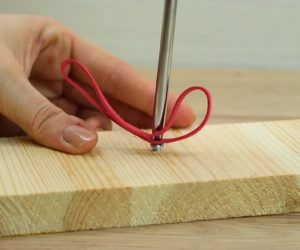 The length of the piece automatically makes it a focal point. 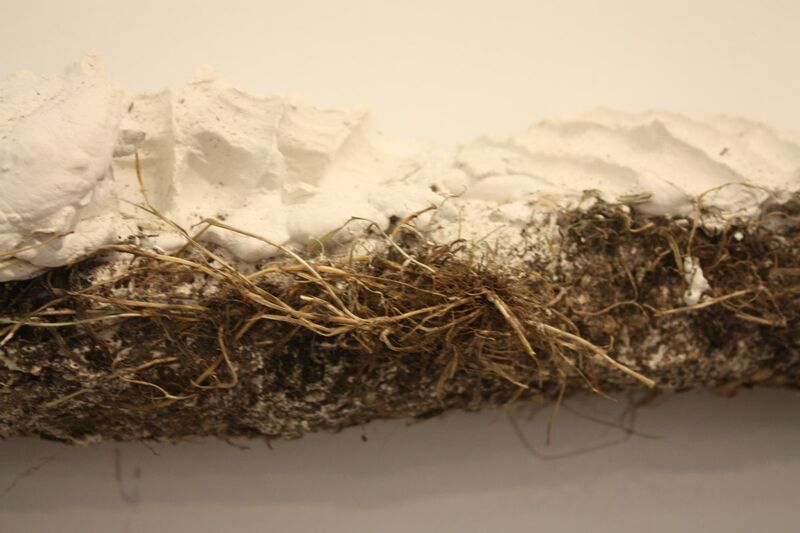 A close-up of the natural materials cast into the work. The dark nature makes it very versatile. Often, textural modern wall art is actually composed of an unexpected material as is this work by Cuban Artist Yoan Capote. This is Palangre (Mar De Fondo), which is dark and dramatic in its texture and shading. Upon closer inspection, you’ll find that it is made from thousands and thousands of real metal fish tools, which increases the spectacular nature of the piece. 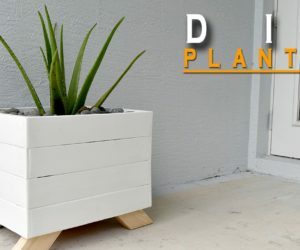 It is a major statement piece that would go just about anywhere and with any type of decor. A closer look at the countless fish hooks that comprise the work. As you can see, there are endless ways to incorporate modern wall art in your home, no matter if your space is large or small, modern, contemporary or eclectic. 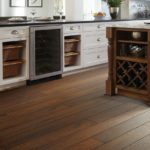 The options are many and typically you will be guided by your personal tastes — as well as your budget. Don’t despair if you fall in love with a work that is outside of your budget. 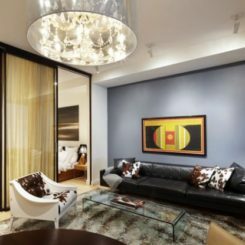 If you can identify the type of art you are looking for, many exciting emerging artists create works at different price points that could be suitable for your decor plans.